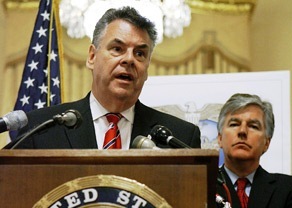 Howard Kudler who is opposing Congressman Peter King, on Long Island, has launched an astonishing attack on King calling him a terrorist collaborator because of his links with Sinn Féin. Kudler has about as much chance as the local dogcatcher has of taking King’s seat and this last second broadside is a pathetic attempt to blacken King. It is a classic low blow, expressed without any knowledge whatever of King’s significant role in bringing Sinn Féin to the negotiating table, and an attempt to smear him with the terrorist label. Let me be clear on this, Peter King for well over two decades was the only significant American political figure to deal with Sinn Féin and to understand the complexity of the situation in Northern Ireland. King played an absolutely huge role in getting the Clinton White House involved in the Irish peace negotiations and he never shirked the hard task of making Sinn Féin completely aware of what America needed from them. Far from encouraging terrorism King helped end Europe's longest war of the twentieth century and can stand up and be very proud of his achievement. As for Howard Kudler he can climb back under what ever rock he appeared from when he is soundly whipped in November. This blatant smear attempt, clearly an effort to win the Jewish vote, will backfire in spectacular fashion. Any Irish American in Long Island district three should vote with their feet November 2 and give King a resounding vote of confidence.